Acrylic House Number Plaque - - bias rectangle sign manufactured on a 45-degree bias and personalized just for you. Made in USA. Holds two, three, or four large numbers or letters. Made from sturdy, non-rusting, and UV-stabilized 1/8" thick laminated acrylic with engraved numbers. Border is the same color as the street numbers and accentuates the hybrid horiztal/vertical footprint. Note: the style number you see on the sample sign (in this case CR1006-45) is for internal use only and is not on your custom sign. 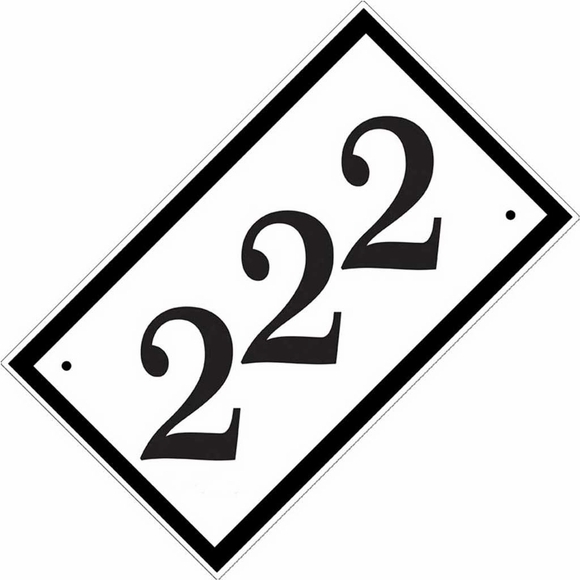 Dimensions: sign measures 11.25" wide across the tips as shown in the large image. Sign itself is a 10" x 6" rectangle. Available in black with white characters and white with black characters. Personalized house sign holds up to four large numbers or letters. Wall mount sign occupies a space that slants from right to left.